"But Rúmil said: 'Ilúvatar was the first beginning, and beyond that no wisdom of the Valar or of Eldar or of Men can go.' 'Who was Ilúvatar?' asked Eriol. 'Was he of the Gods?' 'Nay,' said Rúmil, 'that he was not, for he made them. Ilúvatar is the Lord for Always who dwells beyond the world; who made it and is not of it nor in it, but loves it.' "
Eru (Q. "The One"), also called Ilúvatar (Q, "Allfather"), is the name of the supreme God in north-western Middle-earth. He is the single omnipotent creator, but, according to most beliefs, has delegated most direct action to the Ainur (angelic spirits), including the shaping of the World itself. 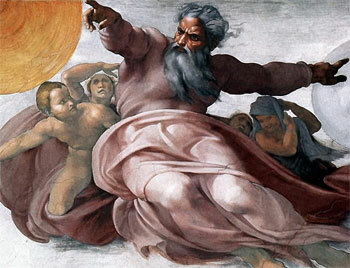 God created Elves and Men, without delegation to the Ainur. Therefore they are called "Children of Ilúvatar" (Ad. Eruhini). Common belief among men is that Eru would someday enter World to save his Children (reflected, for example, in Athrabeth Finrod ah Andreth). In Umbar and Bellakar, God is called Êru. Among the puritan Faithful congregations even the use of Êru is considered impious in any other contexts than the thrice a year prayers. In the beginning was the Word, and the Word was Eä. The World (Q. Arda) is part of Eä, the universe of all which exists. It was first brought into existence with the Music of the Ainur, for the purpose of creating a home for the Children of God. Arda consists of the Earth, its atmosphere, and the celestial objects, including the separate Undying Lands of Aman. The term for the Earth itself is Ambar. In Adûnaic the world was called Kamât, Daira or Aban. The atmosphere is divided into Vista, the breathable "lower" air and Ilmen, the "upper" air or space, where planets and stars exist. Ancient Númenóreans were first to formulate a theory of wandering stars. The oldest surviving astronomical text is the Númenórean tablet of Gimlu-Oresetel (c. II 1600), copy of a list of observations of the motions of the Eärendil's Star. The Númenóreans also laid the foundations of Western astrology. The Batan an-Gimilêphel, written during the Ârûwânai period in the 27th century Second Age, comprises a list of omens and their relationships with various celestial phenomena including the motions of the planets. 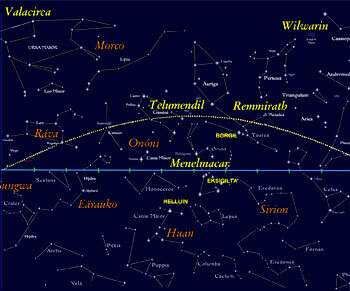 Númenóreans grouped the fixed and wandering stars in companies of seven. "...Only one thing I [Ilúvatar] have added, the fire that giveth Life and Reality, and behold, the Secret Fire burnt at the heart of the world." In Quenta Silmarillion and other mythological texts of the Faithful, The Secret Fire and Flame Imperishable are references to the life-giving power imparted to the world by Eru Ilúvatar, the divine "spark" of life. Melkor, desiring power equal to Ilúvatar, sought for it in vain. Melkor's desire for the Secret Fire led to his rebellion against Ilúvatar. It is part of the Nimruzîrian Trinity (The Word [Eä], The Father [Ilúvatar] and The Secret Flame), a concept devised in Númenor about the triune but inseparable nature of the Godhead. The Flame Imperishable is a central concept in some mystical sects and secret societies, such as the Tindómë-Lië (Golden Dawn) and the Sons of Men (Order of the Red Hand or Côr Carammaitë). "The fëa is indestructible, a unique identity which cannot be disintegrated or absorbed into any other identity." – Commentary on the Athrabeth Finrod ah Andreth. Fëa and hröa are elvish words for "soul" and "body". The plural forms are fëar and hröar. The Children of Ilúvatar are described as existing as two parts: they have a "spirit" or "soul" called fëa, and a body or hröa which is made out of the matter of Arda (erma); for this reason hröar are Marred (or, using another expression, contain a "Melkor ingredient"). According to elven lore, the fëa is powerless without the hröa, and likewise the hröa would die without the fëa. In the Silmarillion, elves do not die of disease or of old age. However, elves may be slain or lose the will to live, for instance because of grief. When an elf dies, the fëa leaves the hröa, which then "dies". The fëa is summoned to the Halls of Mandos, where it is judged; however as with death their free-will is not taken away, they could refuse the summons. If allowed by Mandos, the fëa may be re-embodied into a new body that is identical to the previous hröa (according to Athrabeth Finrod ah Andreth, it may also re-enter the incarnate world through child-birth). A fëa may decide to stay in the Halls of Mandos, or it may be denied re-embodiment. This would normally only occur if it had done much evil (or those Ñoldor under the Doom of Mandos). In such a case the fëa might have to wait very long or might never be allowed to leave Mandos. In Arnorian folklore, Fëanor is doomed to be the gatekeeper, constantly ferrying new souls to Mandos. The situation of Men is different. Immediately after death, the fëa departs to Mandos where it undergoes judgement in which the soul's eternal destiny is specified. According to dualist interpretations of the Númenórean faith common in Umbar and Bellakar, the virtuous are immediately and eternally united with God in the Timeless Halls, others are destined to be purged from their wrong deeds in Mandos. There is no orthodoxy how long mannish souls should remain in the Halls of Mandos. It is universally accepted that mannish fëar have Free Will and thus as able to escape Arda completely to be united with God, whereas Elves are bound by Fate to remain in Arda even after death. Some believe that those who refuse the Love of God, and do not wish to leave Arda, descend into Udûn (Hell) to be thralls of Morgoth until the Second Prophecy is fulfilled and World is made Anew. Not only the Children of Ilúvatar possess souls: they are also granted to some animals, ents and dwarves. In the beginning, the angelic spirits were invited to enter into the world to participate more closely in its ordering and unfolding. Melkor incarnated himself permanently within the world in the attempt to dominate and control matter. He impressed himself totally upon the world, and the world bears his imprint to the extent that he himself is dissipated in the process. Morgoth disseminated his vast power into the world itself with the result that the whole of Middle-earth was "Morgoth's Ring". This means that evil cannot simply be overcome by force without destroying creation, which is in effect to do evils work. Arda Unmarred (Q. Arda Alahasta) is the original world as devised by the Valar, which was effectively destroyed by Melkor. Arda Marred (Q. Arda Hastaina) is the name given to the world as it is: the world after the dispersing of Melkor's fëa in the entire world. It is this world from which are formed the hröa of the Children of Ilúvatar, and therefore it is a cruel and evil world with plagues, famines, extreme colds, heat, and other concepts which do not exist in Arda Unmarred. In Arda Marred all spirits will slowly fade, until at last they are naught but wraiths. One of the special abilities of the Three Rings was that they could delay time, and as such were used by Elrond and Galadriel to preserve their realms. Arda Healed (Q. Arda Envinyanta). After the Dagor Dagorath, Melkor will be destroyed, and the world broken; a new world will then be created by Iluvatar with all his Children, which will be Arda Healed. This world will resemble Arda Unmarred, but will be even better, since it will also incorporate all the good aspects of Arda Marred. The Second Prophecy of Mandos describes the end of the world, called Dagor Dagorath (S. "The Final Battle") as believed by elves and men of Númenor. The Later Silmarillion (Vinyar Silmarillion) ends with a prophecy by Mandos about the Dagor Dagorath, which is omitted from the late Númenórean edition. In Akallabêth, Elendil prophesied that Ar-Pharazôn and his mortal warriors who had set foot on Aman were buried in the Caves of the Forgotten until the "Last Battle and Day of Doom", when they would have to choose between Ilúvatar and Melkor. There are several versions of the Prophecy, but all concur that Melkor will discover how to break the Door of Night, and will destroy the Sun and the Moon. For the love of these, Eärendil will return from the sky and shall meet Tulkas, Eönwë , and Túrin Turambar on the plains of Valinor. All peoples of Middle-earth will participate in this final battle, elves, men and dwarves alike. There the forces of the Valar shall fight against Melkor, who will have resurrected many of his old followers, including Sauron. Ar-Pharazôn and all his men will be released from their eternal prison. Tulkas will wrestle with Melkor, Eönwe will wound him, and it will be by the hand of reborn Túrin Turambar that finally death and destruction will be dealt to Melkor. Túrin will run his reforged black sword Gurthang through Melkor's heart, thus avenging the Children of Húrin and all Men. Then mountains will be levelled, the three Silmarils will be recovered from the earth, sea, and sky, and Fëanor's spirit shall be released from the halls of Mandos to give them to Yavanna, who will break them and rekindle the light. Following this, there will be a Second Music of the Ainur. This song will sing into being a new world, and Men will sing it with the Ainur. "Who is a Númenórean?" 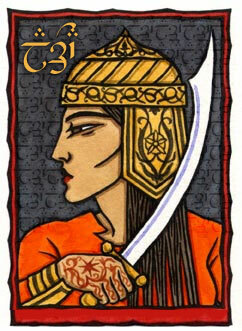 (an-Adûna) is a basic question about Dúnadan identity and considerations of Númenórean self-identification. The question has gained particular legal prominence due to diminishing of pure Númenórean bloodlines since the Downfall. The definition of who is of Númenórean ancestry varies according to whether it is being considered by the Elendili or Ârûwanâi based on normative religious statutes, self-identification or by non-Númenóreans for their own particular purposes. Because Númenórean identity can include characteristics of an ethnicity, a religion, and citizenship, the definition has varied, particularly since the early 6th century schism. According to Namnar Númenórëo, the oldest normative definition, a child born from Númenórean parents is always Númenórean, whatever his actions and beliefs are. In ancient Umbarean civil law, a person is Númenórean by birth if born from Númenórean mother. Gondorian civil law of 840 extend Númenorean citizenship to anyone possessing more than an eight part Númenórean blood. According to Bellakarian tradition an-Adûna is a person who speaks adûnaic as his native tongue and participates in religious observations of the Ârûwanâi, regardless of ethnic origin. 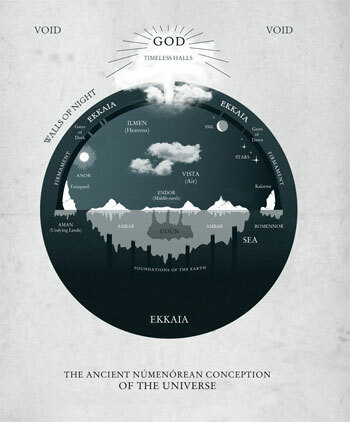 That there is One God, Eru Ilúvatar, who is the Creator of Eä, the World That Is, and everything in it. That the Quenya form of the divine name (Eru) possesses great power in and of itself, and should not be uttered aloud or in vain. 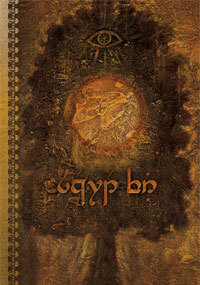 That Valar are the caretakers of the world, exalted angels and stewards of Eru, and the elves are their children. They are patrons of the Númenórean race, forever deserving of homage. They are not to be worshipped per se, but they can act as an intermediary between Men and God. That God has given the people of Númenor thrice great power and longevity than common men, and this gift is linked to the continuing observation of the religious rites of the Faithful and survival of the the divine bloodline of Elros, and that gift could be taken away because of the sins of Men. That men shall not build temples nor any other edifices of worship. That Dúnedain have only one priest, the Dúnadan monarch, and he could be only of the divine line of Elendil. Only a lawful heir of Elendil can supplicate Eru, carry out annual rituals, lead intercessory prayers and bind oaths in the hallowed name of Ilúvatar. That Númenor was destroyed not because men lost faith in God, nor because the annual rituals were discontinued, but because Ar-Pharazôn in his hubris bowed to Melkor and assailed the Undying Lands in vain attempt to obtain immortality. There are more about the únati ("impossibilities") and axani ("immoralities"). Core values: Love, Pity, Humility, Courage and Fealty. In keeping with the commandments of the Balâi (Valar), Númenórean monotheism had centered tightly on religious practices at the Hallow of Meneltarma. However, after the Downfall, Númenóreans were deprived of a central place of worship and religious activity, were unable to fulfill the practices mandated in the Law of the Seven Tablets, and were scattered around the world. Those men of Westernesse, who did not belong to the Faithful, and repudiated the claims of Elendil, had to devise new ways of sacred observance. Ârûwanâi asceticism (also called the legalist School of thought) was one answer to the problem. This new faith was based upon reverence and punctilious adherence to the Laws of Númenor. 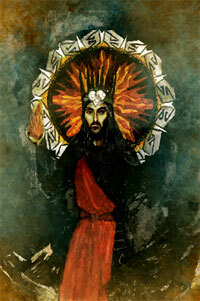 Line of Kings was considered broken after Tar-Palantir and Ar-Pharazôn, so there could be no mediator between Man and God, and all secondary claims to that priesthood (Faithful of Gondor and syncretistic Kâthasaptha of Bellakar) were deemed impious usurpations of that divine prerogative. Asceticism was named for its negative theology and abstinence from all forms of worship. There were no temples, no priests and no religious ceremonies. 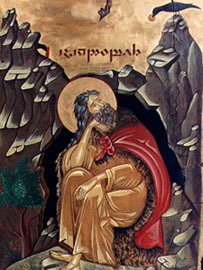 During the Three Prayers (Erukyermë, Erulaitalë and Eruhantalë), Ârûwanâi observed complete silence from noon sunset. Judges (asapthubêths) and teachers of law became great spiritual leaders, and the law schools of Umbar grew in fame among all men of Westernesse. 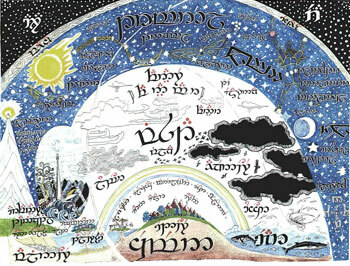 Much of the later Ârûwanâi literature concerns specifying what behavior is sanctioned by the law of Númenor; this body of interpretations is called Batân (the way). One of the pivotal questions which was never satisfactorily answered was the subject of free will in proportion to the divinely ordained fate. Many Umbarean Adûnaim converted to the fatalist school of thought, which stressed the importance of fate over choice: Everything that was and will be was already sung in the First Music of the Ainur. During the last decades of Umbarean independence, a branch of speculative sacral jurisprudence developed from the Bâtan. It tried to console differences between Exiles, and offer alternative paths how the wayward children of Númenor could return to the grace of Êru. They soon digressed to mysticism and symbolic philosophy, while dreaming of Númenor Reborn. This erudite movement was closely connected with the political aims of the Unionists. "Now the summit of mount Minul-Tarik (Meneltarma), the pillar of heaven, in the midst of the land was a hallowed place, for there the adûnaim had been wont to give thanks to Êru, and to adore him; and even in the days of Zigur (Sauron) it had not been defiled. Therefore many men believed that it was not drowned for ever, but rose again above the waves, a lonely island lost in the great waters, if haply a mariner should come upon it. And many there were that after sought for it, because it was said among the remnant of the Adûnaim that the far-sighted men of old could see from the Minul-Tarik the glimmer of the deathless land. For even after their ruin the hearts of the Adûnaim were still set westward; and though they knew that the world was changed, they said: 'Avallone is vanished from the earth, and the land of gift is taken away, and in the world of this present darkness they cannot be found; yet once they were, and therefore they still are in true being and in the whole shape of the world.' And the Adûnaim held that men so blessed might look upon other times than those of the body's life; and they longed ever to escape from the shadows of their exile and to see in some fashion the light that was of old. Therefore some among them would still search the empty seas, hoping to come upon the Lonely Isle, and there to see a vision of things that were. But they found it not, and they said: 'all the ways are bent that once were straight.' For in the youth of the world it was a hard saying to men that the earth was not plain as it seemed to be, and few even of the Faithful of Anadúnë had believed in their hearts this teaching; and when in after days, what by star-craft, what by the voyages of ships that sought out all the ways and waters of the earth, the Kings of Men knew that the world was indeed round, then the belief arose among them that it had so been made only in the time of the great downfall, and was not thus before. Therefore they thought that, while the new world fell away, the old road and the path of the memory of the earth went on towards heaven, as it were a mighty bridge invisible. And many were the rumours and tales among them concerning mariners and men forlorn upon the sea, who by some grace or fate had entered in upon." – Drowning of Anadúnë, Umbarean edition of Akallabêth, annotated by Kheruzîr Azrubêl in III 992. In the "Drowning of Anadúnë", an ancient apographa, the nimir (eldar) had come to the Adûnaim and expressly taught that the world was of its nature round ('as an apple it hangeth on the branches of heaven'), but Zigur (Sauron) coming had gainsaid it ('the world was not a circle closed'). It can be deduced that the author knows that the world is of its nature a globe; but very few of the Adûnaim had believed this teaching until the voyages of the survivors of the Downfall taught them that it was true. Umbrean mariners were the first ones to perceive the spherical shape of the earth, although first circumnavigation is usually attributed to Atandil (Anîzîr) of Anadúnë. According to "Parma gaudion" (S. Book of machines), another Umbarean apographa, Umbarean Adûnaim also built ships that could sail in the "heavy air" and landed in the newly-found western continent or "dark lands", inhabited by savages, and were revered as gods and kings. According to Umbarean beliefs, world has always been a globe, but Sauron tricked men of Westernesse to believe it was plain. In contrast, most Gondorians subscribe to the official theology offered in Akallabêth that world was made round in the Downfall. "Because He is infinite and beyond comprehension it is not fitting for ordinary mortals to worship Eru with words and rituals, at times and places set by human wisdom, but only through silent contemplation of His greatness. Instead, Eru commands that Men honor Him through offering cult to the Kôlir; for being the children of Eru, the Kôlir reveal aspects of the One to His creation." "At dawn on the 13th day of the month of Najam (february), in the third year of the reign of Artârik an-Aranî, it came to pass that Imrathôr, while pursuing his vocation in the bazaars of Hazaj Tollin, felt within his heart a mysterious summons to journey into the foothills of the Hulja Mountains, many leagues distant from the city. Searching for he knew not what, Imrathôr found that his feet were leading him to the tall summit of Urud an-Khibil. On that silent height, hidden from the eyes of Man, Imrathôr received a revelation from the One." – Chronicle of Bellakar, 842. Batan an-Izindi (Ad. "Path of Righteousness") was founded in Bellakar by former bazaar merchant Imrathôr (812-884), who was animated by Adûnai fatalism and mysticial philosophy. In III 842 he retreated into a cave in Urud an-Khibil for forty days, after which he reported having witnessed visitation from the One. Imrathôr received further revelations, which were memorized and recorded by his companions. He changed his name to Izindubêth, the Prophet, and started preaching to his people. He wanted to purify the worship of Êru from haradan idolatry and implored his countrymen to abandon polytheism, while supporting the veneration of the Kôlir as a substitute. After three decades of vicious struggle, followers of the Batan an-Izindi conquered Hazaj Tollin. In 884 Izindubêth ruled over the whole Dune Sea. Even the death of the prophet in the hands of Tedjin invaders and the destruction of the monastery of Urud an-Khibil did nothing to counter the growth of this new movement. After the Adûnai realm of Bellakar collapsed along with its haphazard dualism, the Path of Righteousness started to spread via caravan routes to Raj and eastern Harad. The Path of Righteousness is a curious blend of Númenorean monotheism and philosophically interpreted Bellakaze polytheism. Chief among its innovations is the principles of the spiritual equality of all peoples, Adûnâ and Southron alike, and an internalized ideal of spiritual peace. The first of these principles, while clearly influenced by early Númenórean theology, clashed with the racially-based moral hierarchies subscribed by the Elendili and Ârûwanâi.. The mystical concept of inner peace as a religious goal, on the other hand, resonated with the creed of Haradan goddess worship, though now "restored" to its proper referent: Êru. Followers of the Path testify that "there is no god except Êru and that Izindubêth is the Prophet of Êru", give prayer five times a day, fast in the month of Najam, give alms, and perform a pilgrimage to Urud an-Khibil. They give special offerings to the fourteen Kôlir, saints of the Bellakaze pantheon which are equated with the Balâi. Batan an-Izindi has been especially powerful movement among the camel-herding Urdwan nomads of the Dune Sea, which have almost completely abandoned their earlier shamanism. More than 4/5 of the urban poor in Bozisha-Dar are now adherents of the Batan an-Izindi. While most of the coastal people of Harad have converted into Númenórean monotheism, there are still fierce enclaves of Haruze polytheism. The most important these pagan beliefs is the bronze-age cult of the Three Sisters (or "Veiled Goddess"). 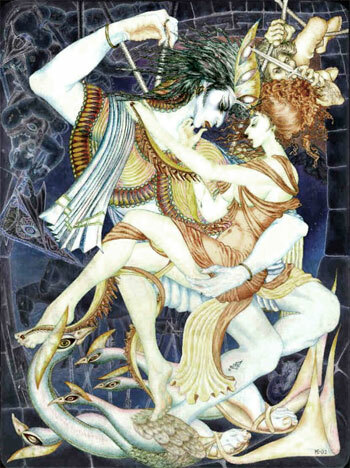 They are triune of female deities once widely worshipped in all Harad: Ishtra, goddess of love and sea; Ladnoca, goddess of fertility, and Manat, goddess of memory and death. Virginal Ishtra, also known as the "Lady of the Morning Star" and the "Daughter of the Western Sea", is the chief deity of Bûr Esmer (Zimra-Zadan). 5th century writer Zaimbar of Korlea tells us that woman of his time would invoke Ishrta from the rooftops, a form of worship quite appropriate to a star goddess. 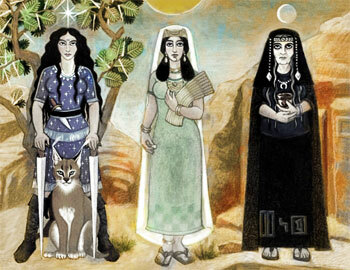 She has connections with the acacia tree, and her sanctuary at Ûrêzâyan has three acacias in which she was believed to descend. She has aspects of both love and war goddess; big cats were sacred to her cult. According to the Chronicles of Gondor, Baruthhîn of Zimrenzil (later Berúthiel, queen of Gondor) brought the cult of Ishtra to Pelargir and Osgiliath. There are still rumours of underground sects among men of Gondor where women revere Berúthiel and worship Ishtra in their nocturnal orgies (sic!). Fertile Ladnoca, who is also called "the Mother of the Gods", is patroness of agriculture and goddess of moon and marriage. She has a sanctuary in the town of Nîlûlonde, which was sacred to her, and her symbol is the crescent moon. For several centuries, cult of Ladnoca has been the official protector of Bozisha-Dar and the kingdom of Raj. Third and eldest of the three sisters is Manat the Crone. Her cult is widespread, though she is particularly worshipped as a black stone at Jebra, near Bûr Esmer. Tombs are placed under her protection, asking her to curse violators. She is also goddess of memory, culture and chaos. Beginning from the 15th century of the Third Age, all three cults have become monopolized by elite citizens, while urban poor has turned to Batan an-Izindi and its call to equality. As long as the rich and mighty pour gold to the cults of the goddesses, they remain important political and social actors in Harad, but they are losing their supporters to both Batan an-Izindi and the cult of Vatra, the sun god of Harad, who is equated with Melkor. Hallow of Mount Mindolluin at the summit of the mountain, where only the Kings of Gondor and their elected followers could go. Amon Anwar, the spiritual centre of Gondor. Here Isildur buried his fathers bones and then called the protection of the Valar upon that hilltop, and they granted it. Isildur swore all those present to secrecy and forbade anyone save an Heir of Elendil from disturbing it. White Tree of Minas Anor, planted by Isildur in memory of his slain brother. King Tar-Palantir of Númenor once prophesied that the life of the White Tree was tied with the lines of the Kings; should it die, then the lines of the Kings would in turn die out. Black Stone of Erech, also known Stone of Loyalty. A great black stone, spherical in shape and some twelve or more feet in diameter. It was half-buried at the top of the Hill of Erech at the mouth of the Blackroot Vale. The Stone is a mysterious and eerie place, shunned by the people of the valley, who claimed it had fallen from the sky, and was haunted by restless spirits. In fact, the Stone had its origins in Númenor, and was brought to Erech after the Downfall by Isildur himself. It was at the Stone of Erech that the King of the Mountains swore allegiance to Isildur's cause in the time of the Last Alliance. When war came, though, he failed to fulfil his oath, and Isildur cursed the King and his people to wander the hills until they made good their promise. Stone of Sorrows upon the slopes of Mount Doom, marking the place where Elendil and Gil-galad were slain and Sauron was finally vanquished. Well of Ulmo, a sacred grotto under Pelargir where the first Faithful convened. Originally the shrine contained a relic of Númenor: Karma (helmet) of Aldarion, founder of the Númenórean Guild of Venturers (the Uinendili), until it was stolen and carried to the Southlands by Herumor and Fuinur, two Dúnadan renegades. Tol Morwen, an island that stood off the coasts of Middle-earth after the drowning of Beleriand at the end of the First Age. It is the site of the Stone of the Hapless. Túrin's grave-mound stood above the ravines and rapids of Teiglin, and later his mother Morwen Eledhwen was also buried in the same place by Húrin. Above the mound was a marker stone, which also commemorated Túrin's sister Niënor who had died in the waters below. Glirhuin the Seer made a song about the grave of Húrin's family, and the Stone of the Hapless that marked it. Glirhuin claimed that the stone would stand even if the sea should flood the lands about. After the War of Wrath, the land was broken and the western ocean did indeed rush into those regions, but Glirhuin's prophecy proved true. The Stone of the Hapless remained above the waves as an island, and became known as Tol Morwen, 'Morwen's Isle'. (Tarma Tar-Calion in Umbar, the great tower and stone where Sauron was first forced to yield to king Ar-Pharazôn and the might of Númenor. Many of the Faithful dúnedain do not count it among the Shrines of Westernesse, because of the memory of Ar-Pharazôn and his pivotal role in the Downfall). Shrine of Courage in Osgiliath, in memory of Ornendil, son of Eldacar, who was executed by the Captains of Pelargir. Hallows of Minas Anor. The Silent Street (Rath Dínen) of Minas Anor, where Gondor's Kings, Stewards and heroes are entombed, lying between the city itself and the steep walls of Mount Mindolluin. "I have gazed on the walls of impregnable Anor and ascended barefooted to the Seventh Court where the White Tree of Isildur flowers, I have witnessed the imposing silence on the Hill of Awe, and paid homage to the Shrine of Pride at the Great Tower of Tar-Calion. I have seen the tomb of Ornendil, the Black Stone of Erech, and the Stone of Sorrows on the slopes of Amon Amarth. But when I reached the sacred island of Tol Morwen, where Húrin, Turin Turambar, Morwen Eledhwen and Nienor Niniel were buried, and experienced the solitude of the most sacred Shrine and vastness of the Western Oceans, I was overcome by a devastating feeling of humility, and I leered across the Sunken Lands to the Forbidden West and prayed Eru Ilúvatar in solitude and silence that He would once redeem us, that the sins of our Forefathers would be absolved and the world made anew." Shrine of Love (White Tree), to known that Providence is with those who love Valar and respect the Firstborn. Shrine of Awe (Amon Anwar), to give deference to Elendil and recognition of his role as the patriarch of the Dúnedain. Shrine of Pride (Tarma Tar-Calion), to understand that excess pride might undo even the greatest of victories. Shrine of Courage (Ornendil), to pay homage to the first martyr of the Kin-strife. Shrine of Fealty (Stone of Erech), to remember that oaths given may never be broken. Shrine of Sorrows (Stone of Sorrows), to mourn those who sacrificed themselves in the great war of the Last Alliance, where Sauron was finally destroyed. Shrine of Humility (Tol Morwen), to submit to the Will of the One, where the Straight Road begin.